Paul studied ceramics to postgraduate level in Cardiff where he has lived and worked since. After completing the BA course in 2000 Paul co-founded Elements Studio and Gallery where he remained for three years as Co-Director before returning to university. Within his first year of professional practice Paul was awarded a Setting Up Grant from the Arts Council of Wales enabling him to develop a body of work and achieve his first solo exhibition ‘Beyond the Surface’ at Oriel Lliw, Pontardawe Arts Centre in 2001. 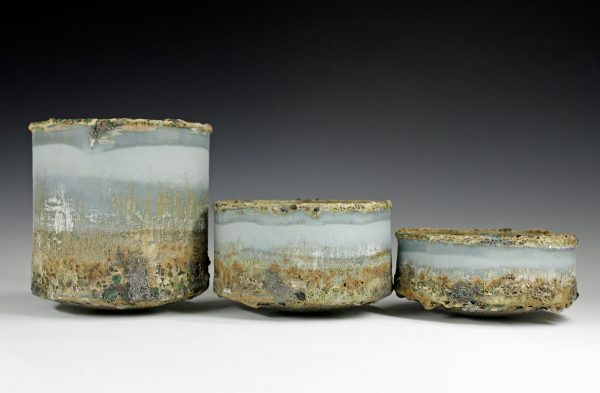 He subsequently exhibited across the UK as well as internationally and in 2002 was awarded Welsh Artist of the Year for the Crafts/Applied Arts category and as a consequence achieved a further solo exhibition in 2003, ‘ A Sense of Order’ at The Model House, Llantrisant. After the completion of his MA in 2004 Paul took time out of exhibiting to reflect on the experience and carry out further research. In 2007 he attained a space at Fireworks Clay Studios where he held the positions of Chair and Co-Director from 2008 until 2013. In 2016 Paul returned to the role of Co-Director. In 2011 Paul was invited to co-select makers for the Elizabeth Wait Purchase Prize exhibition ‘It’s what’s on the outside that matters’ at the Newport Museum and Art Gallery and in 2014 he was invited to select for the Axisweb MA Stars Programme. Paul received further Arts Council of Wales funding in 2014 and 2017 supporting the development of his practice and widening its audience. In 2014 he participated in the Contemporary Craft Festival and Art in Clay and as Guest Maker at Craft in the Bay in 2015. Two key exhibitions are scheduled for the 2017 funded project: ‘Chris Prout and Paul Wearing’ at The Albany Gallery, Cardiff and ‘Form and Texture – New Work by Martin Pearce, Paul Wearing & Rachel Wood’ at Contemporary Ceramics Centre, London. The latter exhibition follows Paul’s 2016 award of Selected Membership of the Craft Potters Association.